Timor and Bowenvale are about 8 km north-west of Maryborough and 140 km north-west of Melbourne. Both are in the vicinity of the junction of the Bet Bet and Timor Creeks, Bowenvale 2 km south-west of the junction and Timor north-east of the junction. Timor is the earlier of the two, beginning as Coxtown when gold was found there in 1856. (Cox was a butcher and hotel keeper). Coxtown was apparently renamed after Timor Creek. Within a few years of its discovery nearly all the easily mined gold had been found at Timor, although about 50 Chinese miners continued there. In the early 1860s a Ballarat mining company successfully mined a deeper lead, moving in the direction of Bowenvale, then known as Chinaman’s Flat. The Chinaman’s Flat school opened in 1864. In the 1870s Chinaman’s Flat was named Bowenvale, after Sir George Bowen, Governor of Victoria (1873-79). 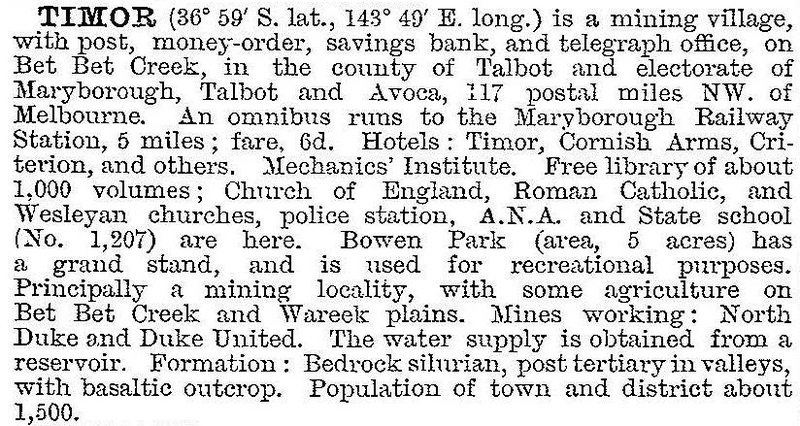 There were post offices at Timor (1865) and Chinaman’s Flat (1861-95). In 1884 the Timor post office was renamed Bowenvale, and kept that named until closed in 1981. School names were the opposite. An elaborate government school was opened at Timor in 1873 and had an enrolment of nearly 500 by 1879, Chinaman’s Flat school was a small place, and there has never been a Bowenvale government school. A cyanide works for gold continued for some years, and farming along the Bet Bet Creek stemmed the loss of population as mining declined. Bowenvale has tennis courts and a hall. Timor has the primary school (33 pupils in 2014). Its last hotel closed in 1963 and its general store closed in 1997.